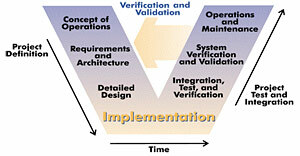 A complete design from requirement to production is a complex sequence, progressing through a number of stages. CPL can contribute to your company's design process in a number of different ways. At the earliest stage of a project, there will probably be a number of competing ideas put forward to meet the specification. The "best" solution will depend on the technical requirement, cost constraints, timescale, in-house experience etc. Based on its knowledge of the characteristics of a wide range of control topologies and components, CPL can help to eliminate the less attractive concepts. For a lens positioning system developed for a client, different schemes for the motor and mechanism were assigned relative scores over a range of attributes to remove the majority of the proposals. Simple test rigs were built to investigate the uncertainties of the two remaining contenders. Usually in a project some elements carry greater risk than others. This may stem from the difficulty of the technical specification or simple lack of familiarity in house. CPL can help identify the highest risk elements and determine the least amount of work necessary to mitigate that risk. For a client's scan carriage controller, the velocity control requirement was an order of magnitude greater than previously attempted. In conjunction with their mechanical engineers, CPL designed a basic controller and applied it to a prototype model to find its performance characteristics. The data gathered was used to confirm the design choice before the detailed design commenced. Following a V model approach, at the start of a detailed design, CPL prepares a specification which responds to the higher level requirement. As well as describing how the design will work, it records the design constraints and defines the interface with the other modules it connects to. Once reviewed and agreed, the proposal can be implemented. As much as possible of the design is simulated, using tools such as Matlab®/Simulink® and SIMetrix, to establish that the design functions. Operation at the constraint limit is also investigated. The simulation data will form part of the final review before a confirmation model is built. In parallel with the design specification, a test plan is also written. 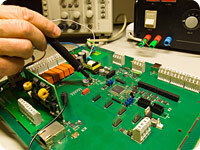 This will stress prototype hardware at and beyond the specification to establish its robustness. Data from the test phase may be used to refine the simulation and improve the design. As well as routine electronic test equipment for drive debugging etc, CPL can test for a range of key mechanical features such as positioning accuracy, repeatability, quality of motion, speed of response etc, all at sub-micron levels. Dynamic features such as frequency response and resonant behaviour can also be evaluated. The test results are documented and form the basis of a final review before the design is taken further.